Pervasive BI - Dream or Reality? Chapter #1: Pervasive BI - Dream or Reality? The concept of pervasive BI refers to the idea that as many employees as possible should use business intelligence tools. The goal is to provide every employee with the right information at the right time so they can make better-informed decisions in their day-to-day work, leading to the improved performance of the entire organization. A growing number of new business intelligence use cases along with increased self-service and easy access on mobile devices are motivating companies to expand BI access to more employees. But how well are businesses actually progressing towards a pervasive BI environment in their organization? With the help of data from The BI Survey, we can answer this question. We look at BI deployment, business intelligence software usage and penetration in companies of different sizes and geographical locations. We compare how widely BI tools are deployed, where they are applied, and analyze the frequency of BI usage across business functions. When analyzing The BI Survey deployment statistics or planning business intelligence initiatives at your own organization, it helps to distinguish between different types of users and the BI activities they perform. For example, do you need a business intelligence product that can generate formatted reports for 1,000+ users? Or do you have 1,000 users who just need to view metrics on a smartphone – reducing demand for self-service creation but increasing the need for responsive user interfaces? Multiple factors including planning, product suitability and even business function impact business intelligence penetration rates across the enterprise. For example, if a BI tool focuses on analytics for a specific department such as legal or finance, you would expect lower total user counts. CALUMO, a company that traditionally targets finance departments at mid-size companies with budgeting and planning solutions, has a mean user penetration rate of 14 percent whereas Microsoft Excel continues to ride high in the penetration chart (38 percent) with its near ubiquitous access on enterprise PCs and laptops. 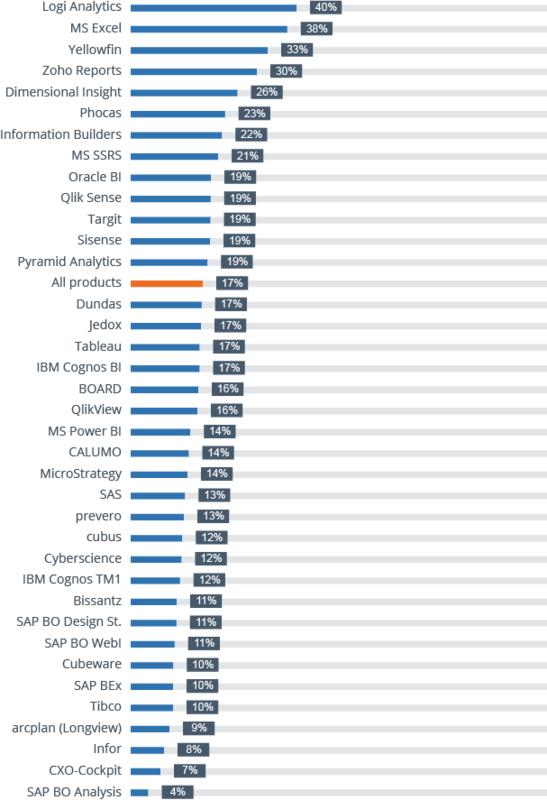 Logi Analytics actually achieves the highest mean penetration rate (40 percent) based on its strength in embedding BI into Web applications. 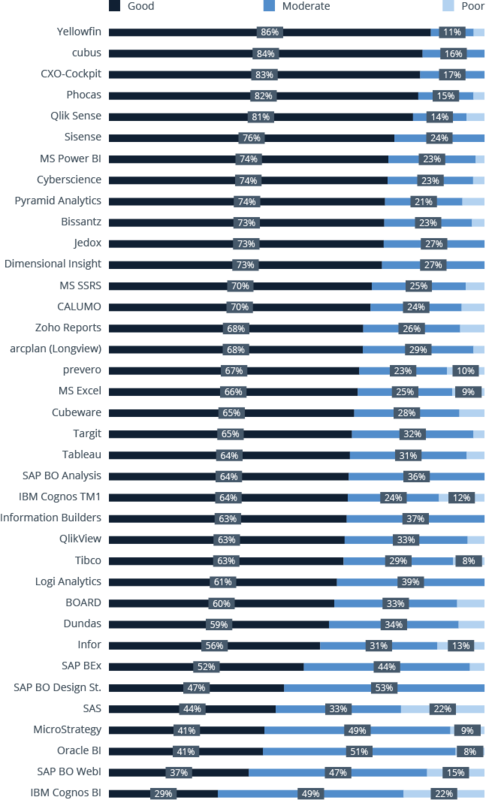 Looking at mean BI penetration rates by region, North America (26 percent) ranks highest followed by the rest of the world (24 percent) and Asia Pacific (22 percent) in third place. These results confirm the prevailing assumption that North American companies are ahead of their European competitors when it comes to making use of business intelligence and analytics software throughout the entire organization. For executives driving towards pervasive BI benefits across the enterprise, price and easy access quickly rise to top of the requirements list. Cloud-based SaaS BI delivery models answer the call for fast and more affordable business intelligence access. For 2016, Zoho Reports (64 percent) takes the top spot amongst companies with less than 100 employees, prevero (84 percent) ranks highest at mid-size companies, and Tibco has the highest proportion of large companies (with more than 2,500 employees) as customers. All three of these BI vendors offer cloud-based deployment options along with licensing models that reduce cost-per-user as the number of employees increase. In the case of Zoho Reports, the vendor publishes user prices and packages to its Web site for easy access and financial planning. A business intelligence platform deployed to support a broad range of applications and groups must efficiently address functional, compliance and operational requirements. A lack of performance or flexibility can result in frustration and force costly follow-on investments in hardware, software or custom development resources to compensate for product shortcomings. In 2016, five BI vendors scored above 80 percent for delivering BI projects within budget: Yellowfin (86 percent), cubus (84 percent), CXO-Cockpit (83 percent), Phocas (82 percent) and Qlik Sense (81 percent). All five have spent years building and refining their product by listening to customers. 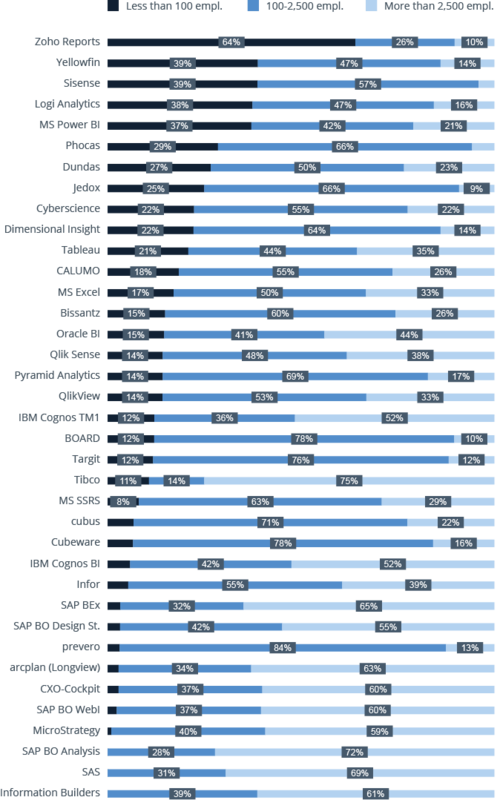 BI products that most frequently exceeded implementation budgets are IBM Cognos Analytics (22 percent), SAS (22 percent), SAP BO WebI (15 percent), Infor (13 percent), IBM Cognos TM1 (12 percent) and prevero (10 percent). The results show that, in general, smaller vendors score better than larger vendors when it comes to completing projects within budget. A focus on a specific industry or solution area also appears to increase the chances of a timely implementation. 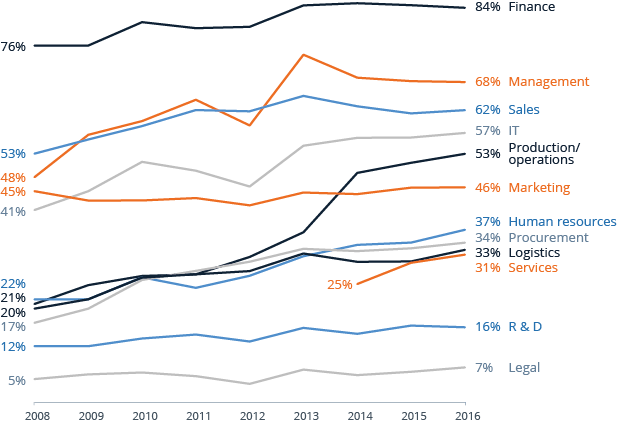 Finance, management and sales departments continue to lead in the use of BI, with sales being the only one showing growth since last year. Marketing use of business intelligence software remains at the same level as 2015 while production/operations, human resources, services, logistics and legal demonstrate year-over-year increases. In particular, production/operations departments continue a strong upwards trajectory, rising from 20 percent to 53 percent usage in the last eight years. Business intelligence has always been strong in sales and finance while production and operations departments have traditionally been more cautious about adopting it. But with the general trend for using data to support decision-making, things are changing. In recent years, products for areas such as event processing and real-time data integration and visualization are now more widely available. Also, the wave of big data analytics from the Internet of Things and the Industrial Internet have increased awareness and the demand for analytics. It’s most likely they will continue to drive further business intelligence usage in production and operations in the next few years.